In the winter, Great Brook Farm State Park in Carlisle is a crystalline wonderland, a web of cross-country ski trails and snow-covered woods. When the warm weather comes, the park offers frozen beauty in another form: about 60 flavors of incredibly rich homemade ice cream, sorbet, sherbet, and frozen yogurt. 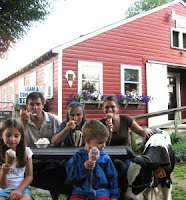 The 1,000-acre park is home to an active dairy farm that operates all year long; the ice cream stand has a viewing area at the back, where you can peek in on some of the more than 100 Holsteins tended by Mark and Tamma Duffy. A small petting zoo has several goats, sheep, pigs, and calves the kids can pet and feed while their ice cream melts on the picnic tables. The park is full of historic markers, from a clutch of 17th-century cellar holes marking “the city’’ where early English settlers lived while working in the mills, to spots used as sacred sites by Native Americans. Barn tours of the dairy are available daily by appointment, and public tours run at set times on weekends from Memorial Day to Labor Day. Ice cream isn't the only draw: In summer, the 20 miles of trails are filled with hikers, cyclists, dog walkers, and horseback riders; campers and letterboxers roam the premises as well. Meadow Pond is said to be a super fishing spot, and offers a canoe launch for those who bring their own. Parking is $2 (free if you’re only stopping for a quick cone), and the rambling, wildflower-edged paths are perfect for letting kids run off their sugar highs. The ice cream stand is open from 11 a.m. until dark, but the rest of the park is open from one hour before sunrise to one hour after sunset.